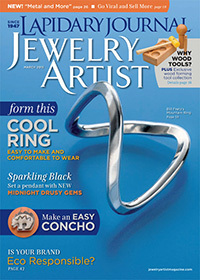 Discover wood tools as a way to give your metal jewelry volume and dimension! Take your metalsmithing to the next level as you learn how to make tubes, speculums, and more with the included wooden tools and plastic mallet. Bonus: Extend the size range of your wooden dapping block set with the Groove Shaping Block and Jumbo Wood Dapping Punches! Don’t need extra dapping tools in larger sizes? Check out the Wood Tools for Forming Ultimate Collection. Expertly form metal with techniques and tools! Are you interested in adding dimension to your metalsmithing projects? Have you been struggling in your efforts to create metal forms without marring the surface of your metal? The Wood Tools for Forming Ultimate Collection is the answer to all of you metal forming problems! Learn how to form metal into spirals, tubes, spiculums, and more with the tools and techniques in this must have kit! Let Anastasia Young’s reference book be your go to for all metalsmithing questions, learn how to create these serpentine forms form the fabricationista Helen I. Driggs in her video workshop, and get started curving and forming metal with the included tools. You won’t want to miss out on this deluxe collection of metalsmithing must-haves featuring an resources and tools for ONLY $159.00! Hurry; there are only 50 collections available! This is the go-to guide and essential look-it-up resource for both student and professional jewelers of all skill levels and interests. Designer and jeweler Anastasia Young has packed all the essential information you need into one amazing volume, including traditional metalsmithing skills and working with alternative materials. Join Helen. I Driggs to discover expert metalsmithing techniques for crafting tubes, spirals, and serpentine forms in your jewelry designs in this detailed jewelry making DVD. Boost your jewelry making skills as you go step-by-step through the process of creating these forms easily and correctly. Use this handy wooden dapping set to add dimension to your metal sheet and wire shapes! With 10 punches in sizes ranging from 5/8” to 2 ½” you are sure to find the perfect punch for every project. 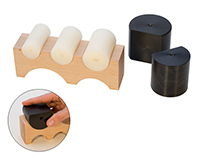 Bend and form metal without marring the surface when you use this hardwood forming block and accompanying nylon rollers. Form everything from bracelets to earrings to the curve you desire using the five depressions of various sizes. This mallet with a plastic head is ideal for forming metal without marring the surface. No metalsmith’s studio should be without a plastic mallet! Add a gentle slope to your metal with the Groove Shaping Block. There are four depressions in this hardwood block that extend the sizes of your wooden dapping block set with sizes that range from 2 ½” to 4”. Use these two large punches with the Groove Shaping Block to gently doom your metal sheet or wire shapes without damaging the surface of the metal. Don't wait—order your collection today!